Novel Craft for Lake Navigation. – Near the Marine railway, at the ship-yard, may be seen a new craft for lake navigation in progress. It is the hull of a large canal boat, covered with a projecting steam boat deck, on the sides of which wheels are to be inserted. This strange looking craft is designed as a horse boat, to run between this village and Sodus Bay. 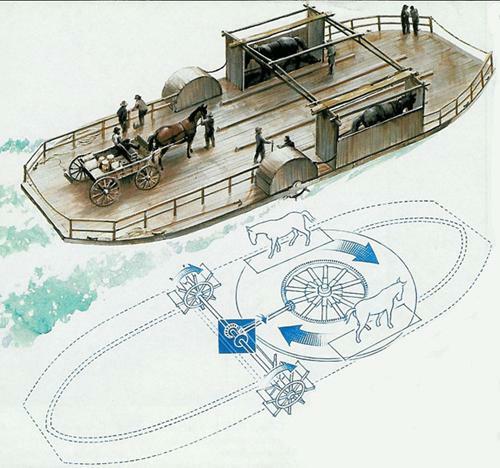 It is intended to bring wood for steamers, and the propellng power will be that of six horses. Should this craft happen to get caught in one of the sudden gales which sometimes stir up the bosom of old Ontario, we wouldn’t like to insure a great premium on horse flesh. This 1850 newspaper article tells of the building of a six horse powered boat. It is a larger version of the one pictured above. This design was created over 2000 years ago by the Romans. They discovered that the maximum speed that could be attained was around 3 MPH. We do not know if this boat ever made the trip to Sodus Bay. Under the best conditions, it would have taken about 12 hours. It would have competed with steam and sail vessels which were not only faster but much safer on the ever changing conditions of Lake Ontario. I suspect that after being built, it was quickly discovered that it was both impractical and not competitive.